Liquid water is essential for the emergence of life at least as we know it on Earth. Written by recognized experts in the field, this volume provides a complete inventory of water throughout the Solar System and a comprehensive overview of the evolution of water from the interstellar medium to the final planetesimals and planets. Through a series of up-to-date review papers, the book describes how water influences the geophysical evolutions of bodies and how it is in turn affected by such evolutions. Processes like atmospheric escape under the effect of stellar irradiation and collisional impacts are discussed in detail, with specific emphasis on the consequences for the budgets of water and volatile elements in general. 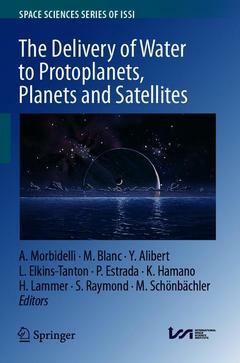 Specific papers on the emergence of life on Earth and the prospects of habitability on extrasolar planets are included. The papers take an interdisciplinary approach to habitability, addressing it from the perspectives of astronomy, planetary science, geochemistry, geophysics and biology. Comprehensive yet easy to read, this volume serves as an invaluable resource to scholarly, professional and general audiences alike. ?Originally published in Space Science Reviews in the Topical Collection "The Delivery of Water to Protoplanets, Planets and Satellites"
Introduction to the Delivery of Water to Proto-Planets, Planets and Satellites.- The Importance of Water for Life.- Water Reservoirs in Small Planetary Bodies: Meteorites, Asteroids, and Comets.- Water in the Earth’s Interior: Distribution and Origin.- Water and Volatile Inventories of Mercury, Venus, the Moon, and Mars.- Water and Volatiles in the Outer Solar System.- Disk Evolution and the Fate of Water.- Giant Planet Formation and Migration.- The Delivery of Water During Terrestrial Planet Formation.- Water Partitioning in Planetary Embryos and Protoplanets with Magma Oceans.- Water and the Interior Structure of Terrestrial Planets and Icy Bodies.- Water Loss from Young Planets.- Atmosphere Impact Losses.- Water in Extrasolar Planets and Implications for Habitability.